There are 6 Assisted Living Facilities in the Timberville area, with 2 in Timberville and 4 nearby. The average cost of assisted living in Timberville is $4,000 per month. This is higher than the national median of $3,346. To help you with your search, browse the 8 reviews below for assisted living facilities in Timberville. Better rated regions include New Market with an average rating of 4.5 out of 5 stars. Caring.com has helped thousands of families find high-quality senior care. To speak with one of our Family Advisors about assisted living options and costs in Timberville, call (855) 863-8283. Timberville, Virginia, is located in the heart of the Shenandoah Valley. It sits between the larger towns of Harrisonburg and Woodstock, and it's surrounded by the Appalachian Mountains. Even though Timberville's senior residents, age 65 and older, is only about 10 percent of the city's total population, there are 16 assisted living facilities in the area. All of these facilities are licensed and regulated by Virginia Department of Social Services to ensure they are following state guidelines and regulations. Timberville has four defined seasons of weather per year, with cold winters and twenty plus inches of snow and temperatures dropping into the low 20s. The summer highs will usually top out in the upper 80s. The air quality in Timberville is good to fair most of the year, as small amounts of pollution can linger in the Shenandoah Valley as well as pollen from the nearby forests, affecting for those with allergies. The cost of living in Timberville is below both state and national averages. However, necessities, like groceries, health care services and utilities, are on par with the national median. This might make it easier for seniors to find affordable goods and services close to home. Seniors in Timberville might feel safer knowing that the city's crime rate is 53 percent lower than the national average, making it safer than approximately 77 percent of U.S. cities. Timberville is serviced by the Valley Program for Aging Services, also known as VPAS, which provides free transportation for seniors around the area. This in includes travel to non-emergency medical appointments, grocery shopping and trips to the bank and pharmacy. The Timberville area has few facilities from which to choose in the event of a medical emergency or illness, with the nearest major hospital located in the nearby town of Winchester to the north. Assisted Living costs in Timberville start around $4,000 per month on average, which is on par with the average cost of assisted living is $4,000 per month, according to the latest figures from Genworth’s Cost of Care Survey. It’s important to note that assisted living rates in Timberville and the surrounding suburbs can vary widely based on factors such as location, the level of care needed, apartment size and the types of amenities offered at each community. 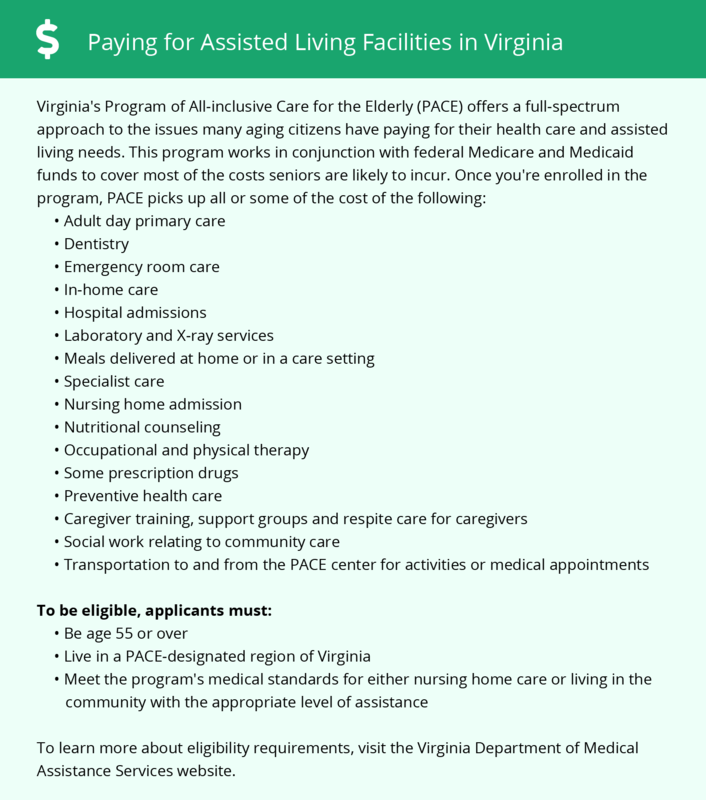 For seniors who need financial aide with assisted living and are already receiving Supplemental Social Income (SSI), there is an Auxiliary Grant offered through the Virginia Department of Social Services. This payment is issued monthly to each senior for the cost of their assisted living facility as long as they qualify for the grant. Timberville and the surrounding area are home to numerous government agencies and non-profit organizations offering help for seniors searching for or currently residing in an assisted living community. These organizations can also provide assistance in a number of other eldercare services such as geriatric care management, elder law advice, estate planning, finding home care and health and wellness programs. To see a list of free assisted living resources in Timberville, please visit our Assisted Living in Virginia page. Timberville-area assisted living communities must adhere to the comprehensive set of state laws and regulations that all assisted living communities in Virginia are required to follow. Visit our Assisted Living in Virginia page for more information about these laws.